In the 2008 Olympics, Beijing managed to reduce its carbon dioxide emissions by 24,000 metric tons per day compared with the previous year. If this could be maintained, and if other large industrial cities did the same, this could make a big impact on global warming. During the Beijing Olympics, these reductions in air pollution were associated with improvements in biomarkers of systemic inflammation and thrombosis in young people (read the abstract). Some of the Olympic venue sites have been cleaned up using bioremediation as part of one of the world’s largest brownfield regeneration projects. Brownfield sites are previous industrial sites and include the Aquatic Centre, where the ground was contaminated with lubricating oil. The process used indigenous microbes to aerobically biodegrade the oil, supported with REGENESIS’ Advanced Oxygen Release Compound, which released oxygen over 12 months. According to a paper in British Journal of Sports Medicine, asthma and airway hyper-responsiveness (AHR) are the most common chronic diseases in Olympic athletes over the past five Olympic games, affecting around 8%. This could be caused by the intense training, perhaps supported by the fact that those athletes with asthma and AHR beat their colleagues. Luc Fusaro, a French engineering and design student, has design a shoe that can be printed using a 3D printer. These could be tailored to an athlete and the designer believes that it could shave 3.5% off a runner’s time. 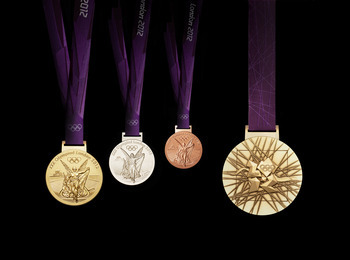 Olympic gold medals are not all gold and haven’t been since 1912. They are 1.34% gold, 92.5% silver and the rest is copper. Silver medals are also 92.5% percent silver, with the rest copper, and the bronze medals are 97% copper, 2.5% zinc and 0.5% tin. Olympicene is a synthetic five-ring polyaromatic hydrocarbon created by researchers at the University of Warwick that looks like the Olympic rings. It has electronic and optical properties. The London Olympic pool has been designed with science in mind – for example, the sides and ends have a special trough that dissipates waves, and the bottom of the pool is movable, again to reduce the impact of waves. The lane markers are also designed to cut turbulence. Pool water will be used to flush the venue’s toilets. In a set of articles in the British Medical Journal, researchers debunked a number of claims for sports products. The color of urine—something athletes are told to keep an eye on—depends on many factors, not just hydration. Drinking before you feel thirsty may worsen performance. Energy drinks with caffeine and other compounds have no benefit above and beyond the boost from caffeine. And carbohydrate and protein combinations post-workout don’t improve performance and recovery. Geek science fact for the Olympics and Paralympics: Does running barefoot cut injuries? Yes. And no. Sorry, not really a fact, is it? Zola Budd ran barefoot in the Olympics in 1984, a race that was controversial for other reasons. Research in Journal of Strength And Conditioning suggests that barefoot running is neither good nor bad, but that both barefoot and shod running need proper training and conditioning.